PHILADELPHIA, PA: From the first-ever coronary artery bypass to today’s dramatic advances in precision cancer treatment, medical innovations continue to revolutionize health care. Novel ways to deliver patient care, and new reimbursement models, are also transforming the landscape. 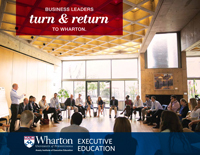 Now, through a partnership of the Aresty Institute of Executive Education at the Wharton School of the University of Pennsylvania and Penn Medicine, leaders in health care and academic medicine will acquire a powerful, strategic approach to innovation to help speed their organizations forward in a rapidly evolving field. The program, titled Health Care Innovation, is designed for senior-level clinicians and health care executives from a variety of settings — large established health care organizations, private practices, and startup companies — both within and outside the U.S. The four-day program will be offered April 25-28, 2019 in Philadelphia, and will guide participants to become catalysts for innovation in their organizations. 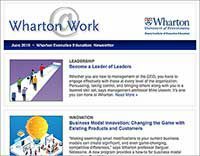 This is the second program for executive health care leadership members to launch from Wharton and Penn Medicine — building on the first course, Leadership in a New Era of Health Care. Changing an institution’s mindset can be challenging, notes Roy Rosin, Penn Medicine’s Chief Innovation Officer and one of the program’s two academic directors. “Even when you have deep and interesting insights on the front line, changing the way people work and getting into these uncomfortable areas of trying something different, is actually very hard to do.” Rosin says the program guides participants to identify and overcome this kind of roadblock by taking a systematic, results-oriented approach. Innovating in health care isn’t just confined to new medical treatments, according to Christian Terwiesch, a Wharton Professor of Operations, Information, and Decisions, who also has a faculty appointment at Penn’s Perelman School of Medicine and is co-academic director of this program. It can also mean fundamentally changing the care model and patient experience, he says, in terms of where medical care happens, who delivers it, and how it’s paid for. For example, connected devices and remote home monitoring combined with algorithms tuned to only engage care teams when necessary mean patients’ health can be efficiently tracked between doctor visits to see what has traditionally been missed, enabling better outcomes at lower cost. Moreover, innovations in business models can lead to new revenue streams and retail trends. The program participants will be delving into all of these possibilities. Health Care Innovation delivers a unique blend of lectures, experiential exercises, small group conversations, and class discussions with Wharton and Penn Medicine faculty as well as with distinguished industry thought leaders. Participants will acquire three crucial perspectives to support them in leading the innovation activities of a health care organization. First they will explore the power of design thinking to stimulate health care innovation. Next, they will receive tools and techniques for managing the innovation process. Finally, they will learn to more successfully manage an innovation portfolio, and to direct the process in a way that aligns with strategic priorities. A notable feature of the program is the Health Care Innovation Tournament. Attendees will generate new ideas based on a specific clinical challenge. The ideas undergo numerous rounds of vetting, and only the most promising ones make it to the final round. This type of tournament has been shown to generate remarkable opportunities. Moreover, it’s a “stepping stone to thinking of innovation as a process as opposed to just kind of ‘magic,’” says Terwiesch. For more information, visit WhartonPennMedInnovation.com.